Yesterday, a posting on a mini-phal /mIni fæl/, a miniature Phalaenopsis (orchid). Which moved me to investigate names of the form /mIni Cæl/, for various consonants C: existing names and ones you can invent, using a /Cæl/ that’s an existing word (pal, gal), a clipping (phal for Phalaenopsis, Cal for California), a nickname (Cal for Calvin, Sal for Sally, Salvatore, or Salvador), or an acronym (HAL for hook and line, HAL for Heuristically programmed ALgorithmic computer). What follows is a mere sampling of such cases, not intended to be exhaustive. Following up on my posting on succinic acid (which led to some discussion of the substance amber), two amber items: a musical interlude, and material about senses of the noun amber. 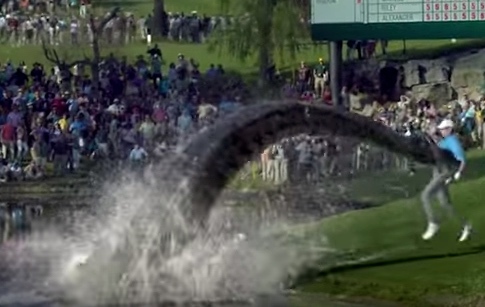 At a golf tournament, a golfer prepares to make a shot over the water. Just before he goes to swing, a kraken emerges from the water and grabs the golfer and his caddy, swinging them around with its tentacles. While all this is happening, the golf commentators continue quietly narrating the event. When you’re a golf commentator, you whisper — It’s what you do. If you want to save 15 percent or more on car insurance, you switch to GEICO. Now, some notes: on the Kraken, and on GEICO and the”It’s What You Do” ads. In the NYT Magazine (on Sunday the 19th), a “Who Made That?” piece by Daniel Engber on the captcha. Some weeks ago, another one of these pieces on laugh tracks on television. Big GROAN (great roar of acronymic nausea). From an appointment on October 2nd with an orthopedist, the clipping nec fac /nɛk fæk/ for necrotizing fasciitis (from the doctor). This was a new abbreviation of the disease name for me; I was accustomed to the initialism NF /ɛn ɛf/ (from other doctors). And I wondered about the /fæk/ piece of the clipping, where I would have expected /fæʃ/ or /fæs/, given the full pronunciation of fasciitis, with one or the other of these as the first syllable. You are currently browsing the archives for the Acronyms category.